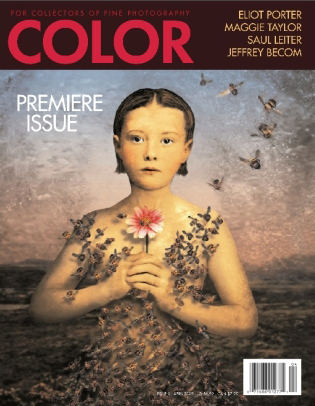 Black and White magazine has recently released a sister publication, Color. It is a bi-monthly publication dedicated to color fine art photography. John Lavine, the editor, says, “part of our mission is to showcase work from lesser-known or emerging artists.” There is very little information available about the magazine on the internet and their website has almost no content. After running through the magazine I’m excited to see where they take it in the future, as it seems to be a promising magazine. I recommend you pick up a copy, if for no other reason than to read the article “Desiring Veracity: The History of Color Photography” by Carol McCusker. It is an article in two parts, part two will be published in the next issue. You won’t get any spoilers from me, but it is well written and worth the $7. This entry was posted on 17 March 2009 at 11:28 am and is filed under Photography. You can follow any responses to this entry through the RSS 2.0 feed. because i want enjoyment, since this this site conations really good funny data too. Love the new magazine. Great for inspiration. Did I mentioned It’s GREAT?